Chic canvas espadrilles finished with playful tassels Jute heel Canvas upper Almond toe Slip-on style Rubber sole Imported. Women's Shoes - Contemporary Womens Shoe. Castañer. Color: Azulon. Size: 35 (5). Chic canvas espadrilles finished with playful tassels Jute heel Canvas upper Almond toe Slip-on style Rubber sole Imported. Women's Shoes - Contemporary Womens Shoe. Castañer. Color: Azulon. Size: 36 (6). Chic canvas espadrilles finished with playful tassels Jute heel Canvas upper Almond toe Slip-on style Rubber sole Imported. Women's Shoes - Contemporary Womens Shoe. Castañer. Color: Azulon. Size: 37 (7). Chic canvas espadrilles finished with playful tassels Jute heel Canvas upper Almond toe Slip-on style Rubber sole Imported. Women's Shoes - Contemporary Womens Shoe. Castañer. Color: Azulon. Size: 38 (8). 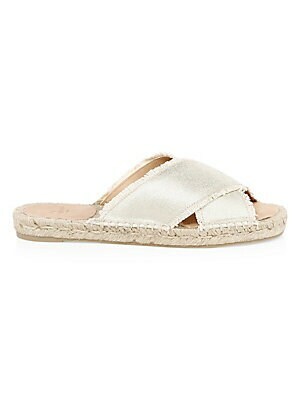 Chic espadrille slides flaunt metallic strap finish Textile upper Slip-on style Open toe Textile lining Rubber sole Made in Spain. Women's Shoes - Contemporary Womens Shoe. Castañer. Color: Champagne. Size: 36 (5.5). Chic espadrille slides flaunt metallic strap finish Textile upper Slip-on style Open toe Textile lining Rubber sole Made in Spain. Women's Shoes - Contemporary Womens Shoe. Castañer. Color: Champagne. Size: 37 (6.5). Chic espadrille slides flaunt metallic strap finish Textile upper Slip-on style Open toe Textile lining Rubber sole Made in Spain. Women's Shoes - Contemporary Womens Shoe. Castañer. Color: Champagne. Size: 38 (7.5). 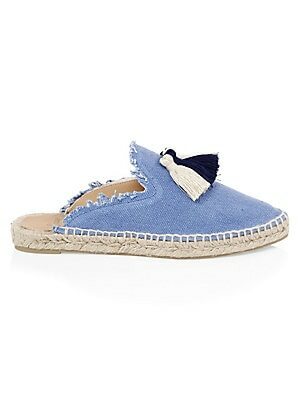 Cotton espadrilles adorned with embroidered crab detail Jute heel Cotton upper and trim Round toe Slip-on style Cowhide lining Rubber sole Imported. Women's Shoes - Contemporary Womens Shoe. Castañer. Color: Natural. Size: 36 (6). 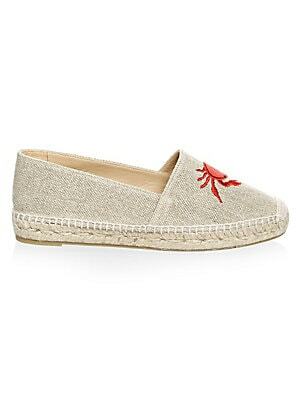 Cotton espadrilles adorned with embroidered crab detail Jute heel Cotton upper and trim Round toe Slip-on style Cowhide lining Rubber sole Imported. Women's Shoes - Contemporary Womens Shoe. Castañer. Color: Natural. Size: 38 (8).